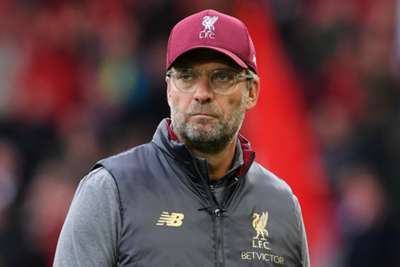 Jurgen Klopp is wary of overreacting to recent scoring struggles and losing the defensive stability that has underpinned Liverpool's strong start to the season. An edgy scoreless draw with Manchester City before the international break left Liverpool with just two goals from their last four competitive matches. Mohamed Salah has symbolised the slump, the normally lethal Egypt international having fired blanks at club level since a 3-0 win at Southampton almost a month ago. But the concession of just three goals in eight Premier League games, nine fewer than this time last term, means Klopp is no rush to deviate from his current course. "It's a normal period of adaptation. You put the focus a bit more on something and immediately you lose a bit of the fluency in something else," said the German. "It's not that we've had no chances, it's just that we didn't use them like we used them in the best period of last season. "I am completely fine with that. We have already had good results and scored goals, but it's obvious that we can improve. "But we need to keep the stability, no doubt about that. What we've done defensively so far is a credit to the whole team. We don't concede a lot of shots in general. "It's not that we don't concede because Alisson makes one world-class save after another. We don't let them shoot that often and that's the best thing. "That we can improve our game is clear. That's what we are going for. That first part of the season is the basis for the rest of the season so let's use it. Now we start again." Concerns in attack will be exacerbated if Sadio Mane fails to be passed fit for Saturday's trip to lowly Huddersfield Town. The Senegal winger hurt his hand while on international duty and underwent surgery upon returning to Merseyside. Klopp will consult with Mane before deciding whether he can compete with a cast against the Terriers. "I really don't know. We have to see," said the Reds boss. "Three days ago he came home, it was diagnosed and blah, blah, blah. "At the moment I have no clue what he can do with the brace on. We will see what he wants to do. It's all about the player. "If he thinks he can play then I need to make a decision about how it looks."